India’s auction for 3G GSM Service licence ended today with bids for pan-India licence touching Rs 16,751 crore which ensures the Government of India a revenue of Rs 67,719 crore. 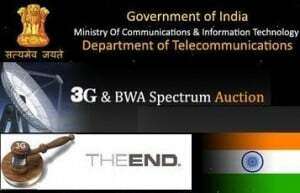 The 3G auction had commenced on 9 April, 2010 and there were nine bidders in the fray for the slots of 3G spectrum on the block. The government auctioned three slots in 17 telecom service areas and four slots in the remaining five states of Punjab, Bihar, Orissa, Jammu and Kashmir and Himachal Pradesh. No single bidder bid for a pan-India 3G license so state operator BSNL would be remain the biggest 3G operator in India. Delhi circle emerged the most valuable circle at Rs.3317 crore, followed by Mumbai at Rs.3247 crore. Among the major bidders, Idea cellular paid nearly Rs.5765 cr for 11 telecom circles, while India’s largest 2G Mobile service operator Bharti Airtel paid Rs.12290 cr for 13 telecom circles, Vodafone Essar will paid Rs. 11617 crore for 9 telecom circle while Reliance Commmunication paid Rs 8583 crore for 13 telecom circles. The winning telecom firms will have to deposit the money within 10 days from now. The successful bidders would be allowed to offer 3G services on a commercial basis from 1st September,2010. State telecom operator BSNL and MTNL already received 3G spectrum outside the auction process, and launched 3G mobile services in more than 430 cities across India,but the bidding price would be determined by the auction price.